1. Your toddler is at least 18 months old. Most kids don’t have the physical coordination and cognitive skills for potty training until they are past their second birthday. Some children may be ready earlier, but you shouldn’t try potty training until your child is at least 18-20 months old, even if they are showing other signs of readiness. 2. Your toddler is physically ready. Your child may be ready to potty train when he is able to stay “dry” for several hours at a time, can walk, sit down, and stand up on his own, and can pull clothing on and off with assistance. 3. Your toddler is showing interest in the potty: If your toddler is showing interest in the potty, following older siblings into the bathroom, or wants to wear “big kid” pants, she is getting used to the idea of using the potty. Toddlers love to mimic adults and older siblings, and you can use this natural inclination to your advantage when it is time to potty train! 4. Your toddler tells you he has a dirty or wet diaper: If your child is letting you know that his diaper is wet, or expresses discomfort with a dirty diaper, he is on track to begin potty training soon. A child that is getting ready for potty training will often remove a soiled diaper or indicate that a new one is needed. 5.Your toddler can follow simple instructions: If your toddler is able to put toys away, or get a ball or toy when asked, she may have the cognitive skills needed to understand what potty training is all about. 6. Your toddler has a stable routine. If you are expecting to move, adding another baby to the family, going back to work, or know some other large change is coming, hold off on the potty training until your toddler is on a stable routine. Having a predictable schedule will help once you start training as well-if you introduce the potty after meals and before nap-times each day, your child will naturally work the potty into her daily routine. When your toddler is reliably displaying some or most of the signs above, it may be time to introduce the potty for the first time. Be patient, and if your child seems unready in any way, put the potty away for a few weeks before trying again. When Your Child Is Showing Signs – Kickstart The Process IMMEDIATELY! **Learn How To Kickstart Potty Training And Have Your Child Trained In 3 DAYS! There are a few signs that let you know when to potty train a child. These potty training readiness signs are fairly common and when you are aware of them potty train your child becomes a lot quicker and easier. 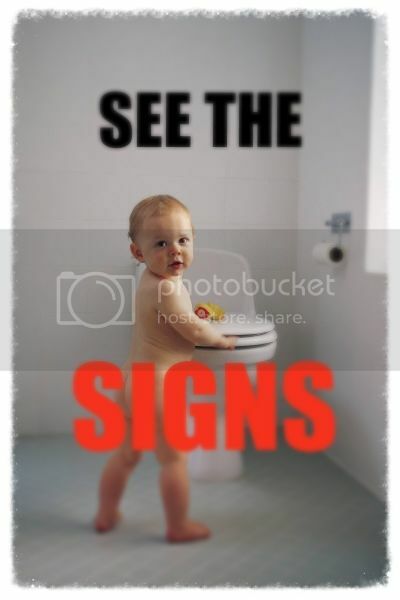 There are several physical signs that might indicate that your child is ready to start potty training. One of the common physical signs that your child is ready to begin toilet training is when you notice that your child has regular, soft poos at relatively predictable times. If your young one doesn’t poo much during the sleep period is also a signal. Another good signal is when your child has a dry diaper or nappy for a good couple of hours. When a child wakes up from a nap with a clean diaper this is a very good sign as well. This is a strong physical sign that means your toddler’s muscles in the bladder are now developed to a sufficient stage that can hold onto liquids and food for longer periods. There are behavioral sign that can give you hints as to when to potty train a child. The first sign is when your child is displaying the desire to become more independent. The child could also show a desire to please and enjoys being praised with encouragement and rewards. When a child starts feeling uncomfortable when the nappy is dirty or wet is a really good step forward. Another readiness sign your child might be ready to begin potty training is if they can pull their pants up and down by themselves. As this is an essential step that’s involved in the process. Its something they might have learned from you when following you into the bathroom. Taking an interest in what the parents do is considered another sign and shows curiosity. A cognitive sign that can let the parent know when to begin potty training is when your child starts to understand and follow simple instructions or questions. For example questions like these are fairly common ways to test whether your child is ready: “Do you have to the toilet?” or “Where’s your potty?” and “Do you need to wee?”. Also, when your child learns words for poo and wee, it means they have a good understanding of exactly what you mean when you ask them if they need to go to the toilet for a poo or wee. Your child may also tell you that he or she has to poo or wee before doing it.